So with the weather perfect and no agitating outside factors (a.k.a. gentleman friends), I experienced two indulgent days filled with perfume, fashion, macarons, olden-days Aristocats architecture, falafels, wine...and black toilet paper (more on that later). All interspersed with walking walking walking. There's nothing like a built-in time limitation to wonderfully focus the mind, so after a night flight from Los Angeles on coach and Ambien, all it took was cappuccino and concealer for me to fake awakeness and hit les rues. I was based near Palais Garnier, so luxury, beauty and sights were all a quick hoof trot away. I set off toward l'Opéra and within spitting distance of the building's golden-winged goddesses, I fetched up outside the Fragonard Perfume Museum. An English language tour was just going in, so I tagged along for an entertaining gawp at a wide variety of fragrance and beauty artifacts. 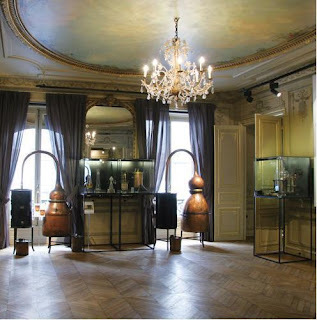 Fragrance artifacts: copper perfume stills and porcelain scent bottles. Of special interest were the 17th century scented beauty spots made of mouse fur. The guide informed us that placement of the spots signified what kind of temptress you might be, what your gig was, what you were into, etc., bypassing those awkward “what's your sign?” conversations at court. I broke off from the group and embarked on independent study of 18th century perfume stills and ancient Egyptian perfume bottles, along with original Guerlain lipsticks from the late 1800s -- the first-ever mass-produced lipstick. I lingered over the displays long enough for to be absorbed into the next tour down the pike -- conducted in Chinese. 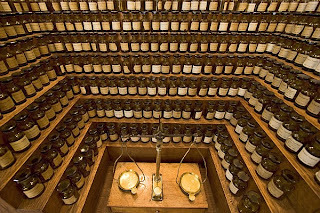 The elegant old rooms turned into a crazed tower of Babel, with multilingual explanations overlapping at a 1920's perfumer's organ stocked with 400 essences. A nasal Tower of Babel. The next stop in my desultory wanderings was the Serge Lutens shop in Palais Royal. A disinterested saleslady presided over the perfumes in the darkened purple room, her boredom somewhat harshing my buzz. I tuned her out and zeroed in my yet-untried Lutens: La Myrrhe (aldehyde sarsaparilla) and Iris Silver Mist (bone-dry petrified iris with a licorice frost). A prototype for Serge Lutens' holiday sample packaging. Smelling like a Serge patchwork quilt, I meandered southward, and just before I hit the Seine, I got sucked into the Sephora in Les Halles. 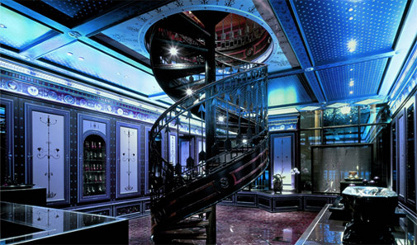 The place is practically a perfume museum of the last 40 years and beyond, and it's not even the flagship Sephora (that would be the Champs-Elysées branch). There's an island of Guerlains with every flavor of Habit Rouge (from L'Eau to L'Extrait), all Les Elixirs Charnels, all the heritages, all L'Art et la Matières. Also unlike American Sephora, it features Serge Lutens and all the Kenzos, including ones I've never seen in the flesh like Jungle L'Éléphant and Ça Sent Beau. The Dior Hypnotic Poison display is one of the stations of the cross, with the eau de toilette, Eau Sensuelle, Elixir and extrait iterations offering increasing degrees of olfactory suffocation. Shaking myself out of my Sephora daze, I allowed the late afternoon sun to summon me onward, to Notre Dame (800 years young! ), to Place des Voges (duel-and-tryst central in the 17th century) and finally to Les Marais for some boutique-hopping and a fortifying falafel sandwich. Read about Day Two (and that black toilet paper!) here. Btw, I just said to someone the other day that Paris is a girl city. :) To be enjoyed either alone or in the company of other women (as I did recently and had the greatest time). Ines, I confess I was a bit intimidated about being there on my own, and was so delighted to learn that it was indeed a girl city!! Hmm, i disagree. I'm a guy and I am in love with Paris. I've been there two times and could easily go there by myself for a few days. But yeah, maybe generaly a girls city, I can see that. Sounds like you had a great time, Katie! 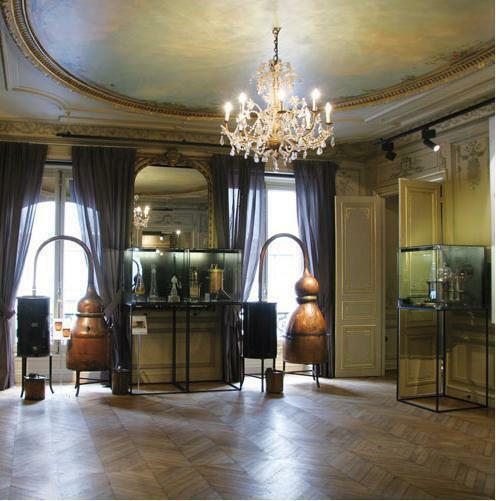 Definetely have to check out that perfume museum on my next visit. Oh, this was so awesome! 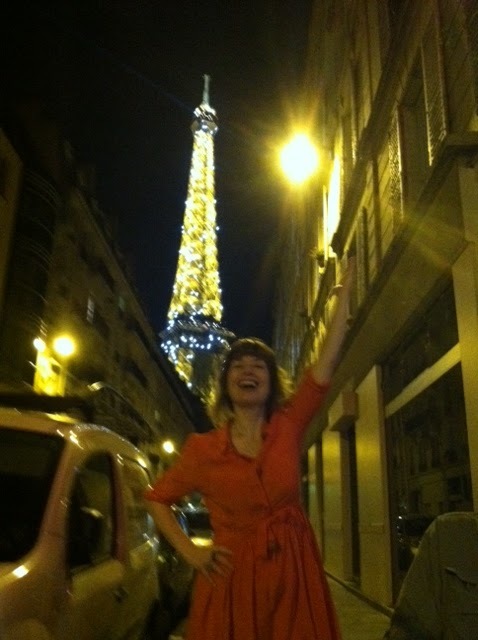 Wish I could have palled around with you in Paris, Miss Katie. Thanks for accompanying me on my mental trip back to Paris, y'all! Purity, it is a stretch to claim Paris for the ladies, but it's true I felt extraordinarily comfortable there on my own. Perhaps we can agree that Paris is the perfect "partner." Hi Katie, March next year I am going on a three day perfume trip with a friend of mine, organized by Roos Lubbers, and I am so looking forward to it. We are visiting 7 perfume houses like Different Company, Shiseido, Guerlain. We are travelling by Thalys, the speed train. Your story is making me even more excited about it. But also looking forward to the story of the black toilet paper. I allowed myself to wander the city with no agenda, but the next time I'm there, I'll certainly be more dedicated to hitting each and every perfume shop. Jelena, Joan and I participated in the time-honored compliment-exchange of women: "You look beautiful!" "So do you!" type of thing. She was the mother of the bride, so I threw in a "Mazel tov!" Sadly, I can't remember what she was wearing, other than she was fully Joaned-up, as you would expect and demand. I lived in Paris for a while in 2008, but wasn't a full-on fumehead at the time, so my perfume knowledge of the city is somewhat lacking ... thank you for this. I was pretty broke at the time so was forced to take on a more affordable obsession: the Parisian Macaron ... hope you had a chance to try some by Pierre Hermé. On 26 August 1944, the day after the final battle for the liberation of Paris, Colonel David Bruce of the OSS (forerunner of the CIA) wrote in his diary: 'At some time during the day I stopped in at Guerlain's, where Monsieur Guerlain very kindly gave me a bottle of Shalimar perfume.' - Pop in and see if you can blag some for yourself! Oh yessiree, Jack - PH macarons were enjoyed to the max. Foie gras macarons were the gastronomic technology breakthrough for me. Matthew - ah yes, a stop at Guerlain is such a palate-cleanser after liberating a city! That's a great little anecdote. The psychic telegraph wires must be humming! Ah, this is so dreamy! I hope you had your fortifying falafel at L'as du Fallafel--a day spent sniffing with a break for one of those sandwiches probably could not be topped. Can't wait for the second day! I think I read once that red toilets violated some health code--surely the same must be true of black toilet paper. What a fantastic snapshot Katie! I'm so impressed by the amount of perfume-nirvana you were able to compress in a two-day stint. My last trip to Paris only lasted one night - and all perfume shops had already closed! I looked through the windows into a dark and empty Maison Francis Kurkdjian. Sad, eh? I've decided to come out of hiding/lurking and post my first comment because I'm too darn excited not to! My boyfriend is taking me to Paris next week (my first time ever! ), and now my excitement to travel there has just been taken up a whole other notch. No, the boyfriend doesn't understand my perfume mania and probably never will, but will that stop me from sniffing out the Guerlains and Serge Lutens of Paris? Absolutely not! Looking forward to part deux! Thanks for sharing! Love your blog, by the way. I'm in LA, so I need to come out next time you have a Scent Bar shindig. 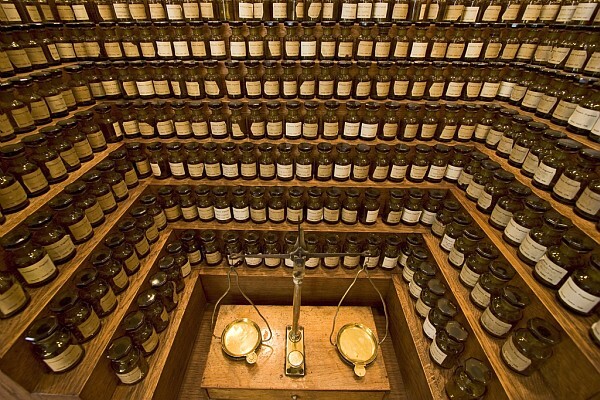 Vanessa - that's really something with our perfume museum post coink! And yes, the Lutens Advent Calendar sample card seems to be designed as a one-time-use deal. But I just smash the corn plasters back down, gluing them to the card with a bit of the perfume wax. Waste not, want not! elizabeth - that's *exactly* where I had my falafel! Steve G (the commenter below you) used to live in the Marais and considerately wrote out a handy guide to perfume nooks and locals-only crannies, including L'as du Fallafel. Steve, it was your 2 pages of hot tips that made my Paris adventure such a success! I thought of you when I stepped inside the pretty little square Place des Vosges: the sun was just going down, the sky was peachy-lavender, and I fully understood why it was your favorite place in the city. And the Marais is an exquisite, quirky little neighborhood that supplies full Parisian pleasure for those with limited exploring time. princessglee - do be sure to read Grain de Musc's Paris Perfume Pilgrimage posts (Left and Right Banks). Hi Joanna! Good timing on my post and your trip, and what a divine holiday gift from your fabulous boyfriend. I was so absorbed in just walking the streets and soaking up the atmosphere (and I was lucky with the summery fall weather), that I missed out on visiting the Guerlain flagship, Frederic Malle, Colette and the other post-modern dept stores, and any number of pastry shops. But they'll be there for my next trip, right? As a note, I found my Time Out Paris guidebook very helpful and reliable. Bejaysus Girl! Terpischorean? I had to look that one up! Great post, glad you had a blast. 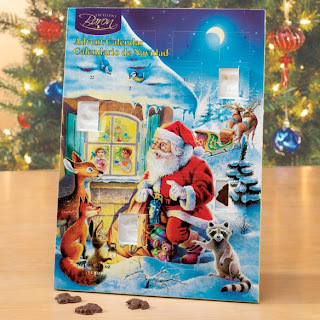 Happy Christmas by the way! Yeah Katie, I very much agree that Paris is the perfect "partner". Something about the atmosphere, right? It's so alive and so beautiful! Katie, what a wonderful, extended date you and Paris had. My only time in Paris was a quick 3 days on the way to another destination. The day after we arrived, jet lag had me up @ midnight, so I hit the streets and had a contemplative, quiet 5 hours of solo wandering as my boyfriend and the rest of Paris slept. Magical intro to the city, though somehow I missed the black TP. Oh well. Next visit. I enjoy reading your rather witty posts (as well as your vlogs!) I love smelling things.... sounds weird but there's just something about smells... and finding your perfume channel was a very very happy accident. That was a few months ago and I'm finally attempting to leave you a comment. Time to stop being shy/creeping on you. Lovely picture, hazy in a nice way and you have a happy glow about you. Paris must be treating you well. A friend of mine is going to Europe (she'll visit France) for this winter and now I'm slightly jealous haha. I'll just have to make the best of this too-green-for-my-liking-winter! Oh, I felt shy at first, too. We're glad to have you here! Welcome aboard, bitter sweet! You're absolutely correct, I was happy and glowing in the photo above. It was taken by a wonderful couple I'd met at a restaurant (Au Bon Accueil, good view of the Eiffel Tower, huh?) - we serendipitously shared a table, we were all from Virginia, and like my late father, they were retired Air Force. It was a very comforting way to conclude my splendid Paris sojourn. Thanks and hello to you too NoraB! Katie - Was there anything at Serge Lutens that surprised you? Were you able to work lunch with Serge into your busy travel schedule? Let me say right here and now how much I ♥ to watch you make me laugh. Did anyone else get smellies for Christmas? I gave my husband a bottle of Thierry Mugler's Cologne and Le Troisemme Homme. 3rd man was blind bought (I almost typed "bling-bought") partially based on your review, Katie. I am not disappointed! Oh, so sweet, Flaconneur. Yes, surprisingly Serge was not waiting eagerly at the door of his shop for me to happen by. Nora, what a wonderful range of smells covered in 2 bottles! No new perfumes for me, but I did get a snazzy camera so I can take pretty pics to show you all. FYI: I have noticed in some of your commentaries that you refer to the resin of Benzoin as 'Ben-Zoyn". I'm surprised to hear you pronounce it this way. It is pronounced Ben'-ZO-in. There in no 'oy' in it. Well lucky us, Anon, we're both right - at least according to the dictionary. Your way is the preferred pronunciation, but the funner "zoyn" is also allowed. Oy! Anon, didn't you know that Katie looooves ben-zoyn? It's her way of shortening "ben-ZOINKS this stuff is great!" Hehe, another Serge corn plaster smasher downer here! Looks like you are or were having a great time! My wife and I last visited about a year ago and I fell in love with everything Paris. I'm an artist so this was heaven for me, the sites, the food, the smell, simply alluring. We visited Guerlain and Creed and I purchased Aventus, simply love it! A restaurant I would recommend the next time out is, Le Comptoir du Relais, we loved it! Princess DvB, consider ourselves named and claimed. As for the Proustian power of perfume, my pen pal Dan calls scent, "imposed nostalgia that's never upsetting." I think of it as a benign time machine. Ruben - there's nothing like being entirely absorbed by a place. Thanks for the restaurant rec - just read up on it and it does look enticing. Glad you enjoyed your time in the City of Light. My favourite Sunday pastime is to wander around the Marais and then eat a falafel sandwich in a quiet public garden. Bliss! If only I'd thought to combine falafel with quiet public garden. Those were separate events on my day. What a fabulous walk, shop and eat day! Sounds like a dream come true. I've been following your YT reviews for some time now. Your silly comments crack me up! I live in Austin, Tx so the closest I've been to fabulous perfumes recently is the Barneys in Dallas this past weekend. When talking about different perfume, I would reference you as though we were friends, "Well Katie on you tube says.....". My perfume guide knew who you were of course. Next month I head to Houston for a weekend to sniff around, and in May I hope to attend the Sniffapalooza event in NYC! One day I hope to head back to Paris and visit SL and Guerlain. I'm tickled to be your virtual friend, whispering into your ear as you go perfume shopping. Let's do it again soon!